Award season may have just come to an end, but that doesn't mean that Hollywood is backing down from prepping for our next round of television awards. With the 68th Annual Emmy Awards scheduled for Sunday, September 18, fans can now expect one television star running the show for the second time since 2012 — Jimmy Kimmel. The news of that Jimmy Kimmel would be hosting the 2016 Emmys was announced Monday morning on Good Morning America and shared directly from Kimmel through a tweet, in which he said: "I am hosting the #Emmys on Sunday Sept 18. Until then, have a great summer." But although the awards are far away — as Kimell very casually pointed out — and James Corden hosting the Tony Awards is next in line, that doesn't stop my mind from reeling about what we can expect at the 2016 Emmys. The best way to get a good idea is to take a look back at what happened the last time Jimmy Kimmel hosted. As a now two-time host of television's biggest night, Kimmel has already proved that he can dominate the award show's stage. However, it has been quite some time, so you can be forgiven for forgetting everything you loved about it back then. Here are some of the best moments from his 2012 Emmys hosting gig. The 2012 show opened with Kimmel sharing his fear for taking the hosting stage. However, with the help of television's biggest stars, he was able to finally pull himself together and get on stage. So, what can we expect this time around? My guess is that Kimmel is going to be a little overly confident going into host the show for a second time. He is sure to dominate his intro again — and I can't wait to see how hilarious wacky it all ends up being. Kimmel really speaks his mind, and, when it comes to pointing out the current trends of the industry and the state of our country, he is not going to hold back. Even though the awards aren't until September, I can already see the political jokes, comments on diversity within the industry, and new thoughts on the impact of streaming television online (Notice how back then his comments were just about HBO?). The concept of award shows making viral history has definitely intensified since Kimmel first hosted. However, this clever moment from the 2012 show only means that, in 2016, we can expect something bigger and bolder. I have my bets on Kimmel breaking the internet. I just can't wait to find out how. Whether it's a reappearance from his parents or the forced exit from someone else in the audience, I can totally see something like this happening again. Not only was this moment from 2012 show hilarious, but it also helped give the audience a little piece of the host's life. Kimmel didn't just shout out the great television of the year in 2012, but he also was sure to look back at the history of television quite a few times. And, boy, have times changed. Four years ago, the host looked at television before cable, so this year? I'm looking forward to a look at television watching before streaming. We all know that award shows are perpetually long. And getting speeches cut short can be a challenge when everyone has a long list of people they want to thank. 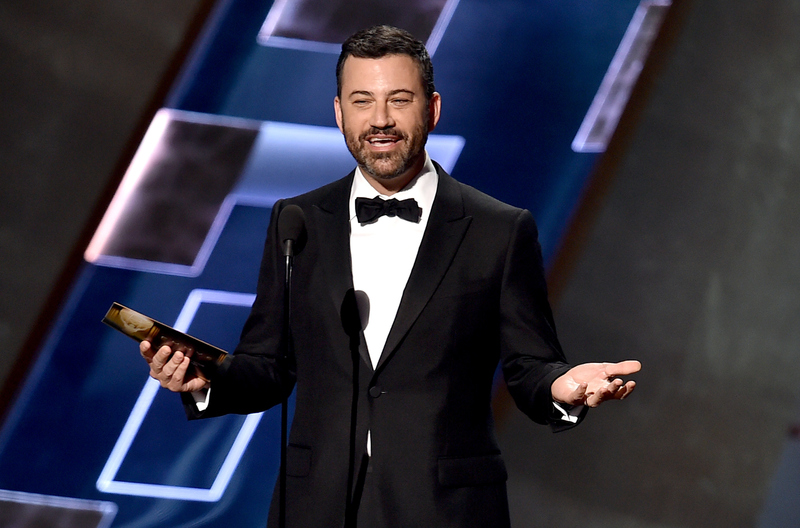 However, Kimmel handled the awkwardly long award show end speech with the perfect joke. And now, after that little quip, I have a feeling he's going to mention the length of speeches at little more upfront this time. From rolling out the red carpet to feeling the pressures of past hosts, Kimmel is going to bring his all to the show both on stage and behind-the-scenes. And, being that he has a better grasp on it now, the quality of the show can really only go up. Here's to hearing about the preparation process leading up until then. But the past is in the past. Now, we have to wait to see what he can bring to the stage next. The 68th Annual Emmys hosted by Jimmy Kimmel will air on Sunday, September 18 on ABC, and I know you'll all be tuning in.